Any replacement suggestions for the 2n1308? Small Bear has a 2N1306 PNP. Is that compatible? Aren't the even numbered one PNP and the odd ones NPN? Or did it just work out that way? Is the 2N404 usable here? You need to use NPN transistors but pretty much anything would be ok. I just bought some 2N1306's for an Openhaus, so that will probably be a good choice. It doesn't follow the even or odd last number rules, although the 1306, 1308 and 1310 are all NPN, so Smallbear must have them marked up incorrectly. Russian MP38A's may be pretty good for this too, although maybe not quite as much gain as you would like, but they can be found cheaply and in quantity. My 1306's from Small Bear work great! I noticed a couple of value changes I missed, so if you want to build it grab the latest layout now posted above. OH MY GOD YES! This is number one on my most wanted-list. Ordering the parts already. You're the man! Nonetheless, the Hoof is really very, VERY good Muff take. Hi Mark, I built this early this month using my own layout which is based on one of your other big muff layouts, so this one is almost identical to mine. The values and components look good to me. I have to change the lower left resistor, I used 390R instead of 100R but it sounds good. You'll never see the schematics here unless either we did them ourselves, or we have permission to post them. If we don't we're not going to do anything which could have negative implications for the site. But like we've always said, the schematics for 99% of the layouts we do here can be found easily on freestompboxes.org, so if you do a bit of searching, I'm sure you'll find it no problem. Thanks for this one IvIark~! 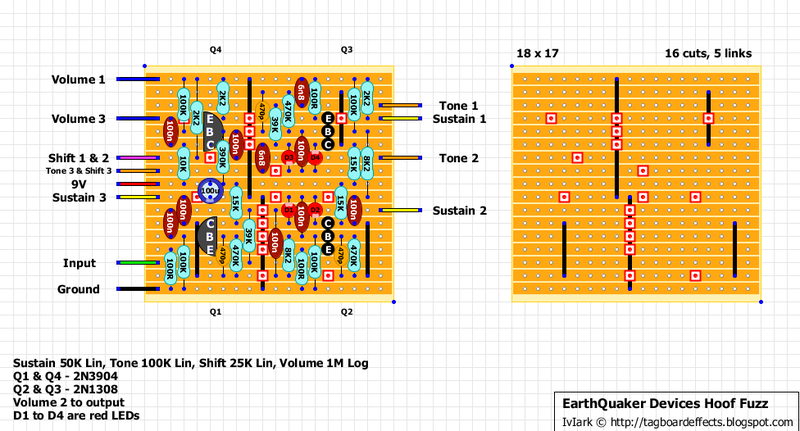 I built the layout posted by JohnK under the Crimson Drive page (http://johnkvintageguitars.homestead.com/Effects/Fuzz-ODs/Hoof/01-Hoof-VERO.png). Is there a schematic similar to the Hoowf Fuzz for this layout? I noticed that my build didn't sound too close to Hoof Fuzz. If this part of the circuit is different then I will build this one as well. FYI JohnK's sound really good but I want the Hoof tone. That's the schematic I did it from too, and that cap is just a PS filter from 9V to ground and so unless your last build was noisy, isn't going to make a difference if everything else matches. Awesome thanks!! It is only noisy when the volume knob is cranked. I would expect noise with the amount of volume it has. I must say this site is AMAZING and thank you for all the effort. Hi there, I'm fairly new to building effects, in fact this is my first build and this may sound like a stupid question but here goes, I noticed on your diagram is says Volume 2 to Output, does this mean wire Volume 2 straight to the tip of the Output jack? Does this then bypass the need for a board output connection? It means volume 2 is the final output of the effect, so that is what goes back to the stomp switch which is then wired as per the Offboard page. Ahh, thank you very much. This all makes sense now. Built this. I have a bunch of AC176 and AC187 and tried them. Even the ones with the highest Hfe did not deliver the gain heard in the PGS demo. I tought why not trying some Si diodes? So I swapped all four to MPSA18. And yes, that's it for me. Now it's not far from a standard Big Muff, but with the extra Shift control and the Hoof's tone stack. Love it. Will do some comparison with my Fire Red Fuzz clone and will see which goes into my board. What sort of gain Ge did you use? Unfortunately I don't know what gain they were in the original and so we don't have a point of reference, but I think that should still make this verified, so thanks for that buddy. Was there a previous version to this layout? I built the one that popped up on Google first. This is only my 3rd build and I am still not good finding issues. At max the volume is at unity, and there is very little gain. I used 2n1306 work a likes from small bear. I am wondering if anyone can help? This was originally posted on 31st March and the creation date of the latest version of the layout graphic file is the 19th April. That doesn't necessarily mean anything significant was changed, I may have just shifted things about a bit if I didn't like the look of something which I do with most of the layouts. The best way to fault find in the first instance will always be to measure the transistor voltages, so if you can do that and post them here it will give us a good clue. The only voltage that looks like what I would expect is Q4, so I'd be checking part placement, soldering and values from the start. Q2 is miles off and the most obvious problem area, but whether it's the transistor or surrounding components needs to be established by looking at what you've put together closely. Well easy enough Q2 and 3 were backwards. Works great now thanks! Hope someone cal help with this... Does it matter if the LEDs are 3mm or 5mm? I just build the pedal and generally it works, but the amplification is rather low and the distorted sound is quiet farty. So I have to crank the Volume knob to match my clean Volume. I used AC 173 with HFE 90-100. Is that normal???? Sounds like your transistors are misbiased. I dunno, it could be a number of things. I guess you should test your voltages against one which is working properly. Thanks, Charles. I should measure the voltages and post them. Hi! Does anyone know anything about the version "cloven"? Hi. I live in Brazil and I don't find any NPN Ge hear. Can i use only silicon NPN for build this? Any suggestion? Yes but it will most likely sound a little different. Give it a try it wont hurt anything. Hi, I built this one and it has very nice sound, however I noticed that during play only D3 and D4 glows during play and D1 and D2 are off. Should't D1 and D2 glows as well? Built one of these using 2n1304 transistors instead of 2n1308s and in4148 diodes instead of LEDs. Brutal doesn't even cover it; this is everything a Muff variant should be! I want to reduce gain. Can I put M1B pot before 39K resistor (input) for example or is it better M1A pot? That was my first build from this page and it worked on the first try. Great layout, great sound and I managed to fit it into a 1590b :-D.
I used yellow LED's instead of the red ones and 2n2369a silicium trannies instead of the germaniums in the original. Yet it sounds very smooth and almost identical to the original (borrowed a friends hoof for comparison). To be honest, I doubt anyone could point out which one's the original in a blindfold challenge. Today I swapped the 2n2369a for two vintage OC139 and that sounds really cool. Way less gain but very juicy. I prefer my original version with the 2n2369 but I guess I have to build a second one. Hello. According to KITRAE leds and capacitors (100 nF) near Q2 and Q3 must be replaced. I mean 100 nF goes to collector and pair of leds go to base. Am I right? You’re not. Since they’re in series it doesnt matter which is first, the current doesn’t care. I just can't put in words how much I love this pedal! One of my first builds and on my board ever since.